Last weekend I escaped for a wonderful relaxing time with a group of dear friends. It was the perfect little retreat, and I loved every minute spent with these girls. Karla invited us to her home, and we spent the days creating together, antiquing together and eating cupcakes together. What more could a girl ask for? Karla made us all feel so welcome, and didn't mind that we were snapping paparazzi-style photos of her studio. It is a feast for the eyes! We all walked in and just sort of stood there in awe, coveting the space full of beautiful things, with hidden treasures in every nook. See those cabinet doors? They are bursting with vintage hats...and that's just the very tip of the iceberg. We crafted and crafted until our eyes started to cross. I don't think any of us could keep up with Karla though. She truly lives and breathes art, which is amazing to witness. Beth stopped by too, and joined us for a day of crafting. We each made a miniature dressform from scratch using a really creative technique Karla taught us. I love how each one is so different from the next. So pretty all together! We did some antiquing. I was obviously very excited with my purchases. We were all loving the Victorian Trading Company store. I didn't realize they had an actual store front. Did you know? A little slice of heaven! We headed to Missouri for a visit with Carol, and got a chance to see her beautiful new (old) farmhouse. She set such a lovely Spring table for dinner, and once again we became paparazzi snapping photos of her gorgeous home. Cameras were clicking! Really, I have no words, but it made me want to come home and redecorate my house. You can see pictures of the table setting in Carol's recent blog post. And Jenn has lots of photos of Carol's home and Karla's amazing studio in her recent blog post. It's worth checking out for all the inspiration. I thought this was a sweet picture of Lori and Carol, in Carol's home. Here is a shot of Heather photographing the pretty table. The best part about the weekend was that we all "get" each other and appreciate good design, good crafts, good antiquing, and good food! And then we headed outdoors for fireside wine and laughter. I hadn't been away from my kids for well over a year, and I came home feeling so REFRESHED, relaxed, inspired and ready to take on the world. How is it that a few days away can do wonders for your soul? It is so wonderful to see this gathering. So glad you all have such a lovely time. I'd love to hang out with such a great group! You may not know how important you all are to me. Back in 2008, you six had the first blogs I read regularly. 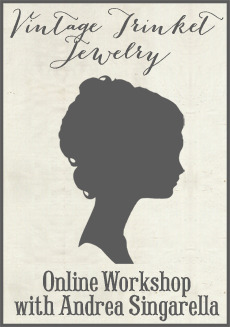 They were what inspired me to start my own blog, finally open an antique shop, & attend Silver Bella. Thanks ever so! WOW! An AMAZING time with AMAZING friends! Congrats to all of you for taking time for yourselves. I feel relaxed just reading about it. Then again....it could just be the wine! It was so fun because of the great company! What a perfect group. I hope we can do this again. Thanks for coming. Andrea- I'm so glad your weekend was refreshing, but I'm a little sad that you still haven't been to an estate sale...but it was fun to see you! Wow,what a great event! Girl time is good for the soul! Hi there to all, how is all, I think every one is getting more from this web page, and your views are fastidious in support of new users.